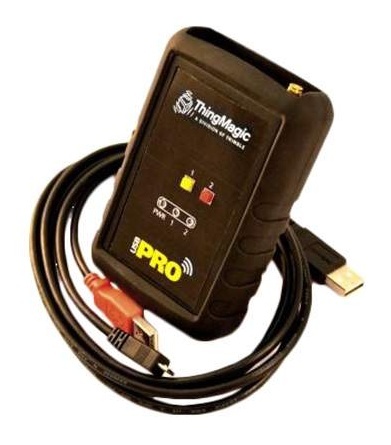 ThingMagic USB Pro RFID Reader Desktop RFID Reader The USB Pro RFID Reader is that latest desktop RFID reader from the ThingMagic division of Trimble. Based on the M6e-Micro LTE RFID module the USB Pro reader offers a number of enhancements including: Wider power rangeNew external antenna portEnhanced firmware features The USB Pro reader is preconfigured for most regions in the world including the Americas (FCC / IC rules) Europe (ETSI rules) India (TRAI) Korea (KCC) Australia (ACMA) China (SRRC-MII) and Japan (MIC). The reader also has a customizable option to accomodate other areas and research applications. The wider power range from -5 to +30 dBm gives greater flexibilty in applying the reader. With internal and external antenna options power setting may now be varied to match a wider range of applcations. The enhanced firmware assoicated with the M6e-Micro LTE module includes support for ISO 18000 6C Gen2V2 tags, faster initialization on startup and additional protocol support (may require additional licensing).